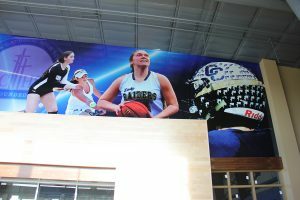 This project was completed for Central Catholic High School. A new gymnasium is being built for the school and this mural covers the back entrance wall to the lobby of the gym. 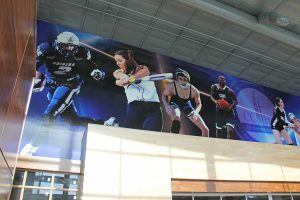 The mural is over 21′ tall at it’s highest point and spans 79′ long, made up of 19 panels of graphics.